And on November 1st, 2018, in keeping with that task and guided by its mission to be transparent and accountable, the University of Belize, under the leadership of President Sankat, released its Annual Report for the academic year 2016-2017 – a first in terms of its timeliness. The report outlined key information about the University’s activities, achievements, statistics, operations and financial performance including audited financial statements. In addressing the gathering, the President noted that the 2016-2017 academic year had set the stage for transition leading to transformation, as evidenced by the new appointment of the seventh President of UB, by the new programs it subsequently implemented, the actions it is taking to make the University more productive operationally and to bridge the financial gap. The Chief Executive Officer in the Ministry of Education, Culture, Youth and Sports, Ms. Deborah Domingo was also present, and she assured the University of the continued support from the Ministry. She also extended her congratulations to the University for being accountable and compliant, through its timely financial report. 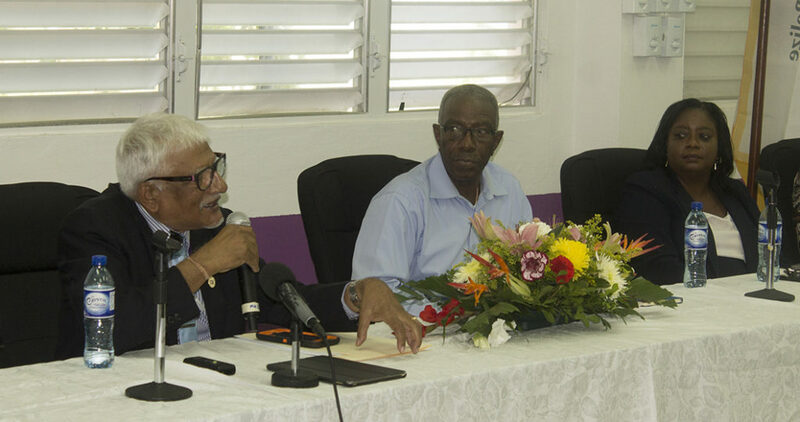 Also, Chairman of the UB Board of Trustees, Mr. Harrison Pilgrim, commended the University of Belize for the transformative path it has taken in meeting the developmental needs of Belize, and urged all of Belize to support the efforts of the UB towards creative change. The most notable moments from the presentation were the highlights from each of its faculties and the articulation of UB’s financial position. As noted by the President, the 2016-2017 academic year saw UB developing a stronger profile for its teaching and learning capability. It engaged with Partners for more work-integrated learning experiences, internships and mobility for students; it conducted community outreach efforts that contributed to public conversations and it expanded key programs across the University’s campuses and through the University’s online platform. It was also mentioned that its objective to produce graduates who are analytical, disciplined, entrepreneurial and skilled communicators was also achieved as approximately 598 Students successfully participated in the University’s various internship programs; which seek to give students practical experience in professional environments and to build the foundations for their future careers. As well, 12 students participated in the University’s Student Exchange Programs with UB’s partner universities in the USA, Canada and Spain. This exchange assists students with becoming aware of and adopting alternative, multi-faceted approaches to learning as well as enhance their perspective of global issues. In this vein, he went on to note that UB saw a small decrease in tuition and fees revenue during the year under review due to a reduced enrolment in the University’s bachelor, associate and certificate programs. Operations were further constrained as a result of growing operating costs and much needed infrastructural developments on the main campus and its other satellite sites. Moreover, although operating expenses were closely managed to improve efficiency and ensure value for money, these costs exceeded operating revenues. UB also recognized a loss of $3.4m on the de-recognition of Middle Long Caye and earnings from interest and investments declined due to the drastically reduced interest rates on investments and the banks’ discontinuance of interest offers on term deposits. Deficits were borne by cash reserves which reduced current assets. As a result, Mrs. Sherlene Julien, UB’s Director of Finance, emphasized that while prudent cash management strategies were employed, these alone were not able to bridge the gap for the University’s operating deficit. Therefore, UB must infuse its operations with new energy, innovation, and visible transformation. Ultimately, this requires an influx of new funding through public/private sector financial support, an increased subvention and/or a new tuition and fees formula in order to forge ahead on its mission to enrich the lives of our students through education. As can be seen, UB’s 18th year continues to be one of transition. Like many young adults, transitioning into adulthood is a high-stakes moment; and so it was for Belize’s National University – pragmatically and symbolically. And as mentioned by the President, the 2016-2017 academic year set the foundation for the University’s transition into adulthood, its transformation. The 2016-2017 academic year, under firstly Mr. Alan Slusher and then President Sankat, allowed UB to create new working relationships, balance continuities with change and form new ways of thinking. Therefore, as we work together to build the next best possibilities for UB, let us, in the best traditions of academic inquiry, chart the next course on this journey of perpetual discovery!